CHICAGO (Reuters) - Winning more support from Chicago’s black community, which makes up about one third of the electorate, will be essential if Jesus “Chuy” Garcia is to cause one of the biggest political upsets of recent years by defeating incumbent Rahm Emanuel in a run-off and become Chicago’s first Hispanic mayor. He will need to overcome tensions between the black and Hispanic communities in the city, aggravated under the 22-year term of Mayor Richard M. Daley, which ended in 2011. There was a widespread perception in the black community that Hispanic supporters of Daley were favored in getting city jobs. But while in 2011 majority African-American wards gave overwhelming backing to Emanuel, who was previously President Barack Obama's chief of staff, some disillusionment has set in since. A persistently high crime rate, the decision to close 50 schools in mostly poor areas, and a sense that Emanuel is out of touch with the community and its problems has hurt him among black voters, some political activists say. After spending more than $7 million on television ads alone, Emanuel won 45.5 percent of the vote in the first round last Tuesday - the largest tally of the five contenders but short of the 50 percent plus one vote needed to avoid an April 7 run-off. Garcia, a soft-spoken 58-year-old Mexican immigrant and county commissioner, who raised less than $1.5 million and only bought TV ads in February, came in with 33.6 percent of the vote. Emanuel’s backing in predominantly black wards slipped to just 42 percent, from about 59 percent in 2011, according to the Illinois Election Data web site, while Garcia had 26 percent of the votes. The other 32 percent in those wards went to the three other candidates - two blacks and one white - who have now been eliminated from the race, leaving those votes up for grabs. Emanuel has stronger support in majority-white wards, with 52 percent, which is the same level that Garcia received in majority-Hispanic wards. In his bid for re-election, Emanuel has stressed that he is the only candidate who can make tough decisions to rein in the city's budget deficit, expected to grow to $1.2 billion by next year, and deal with massive unfunded pension obligations for city workers. Garcia has criticized Emanuel's authoritarian style, and said that while he knows sacrifices are needed he would listen to residents before making controversial cuts. Chicago is a city where racial politics tend to spell out the calculus of victory, especially given the three major ethnic groups each have roughly the same number of votes. There are, though, plenty of complexities – for example, the Hispanic vote includes people with various countries of origin, particularly Mexico and Puerto Rico. About 5.5 percent of the population is of Asian descent. In Chicago, building an African-American and Hispanic coalition is no easy task. A "black-brown" coalition formed under the city's first black mayor, Harold Washington, in the early 1980s, but was never solid and fell apart after Washington's death in 1987, said Delmarie Cobb, an African-American political consultant. The resentment among blacks that was built up under Daley’s rule persists today, Cobb noted. "Now, there's even more of a feeling of us versus them," Cobb said. "That's what Jesus has to overcome." 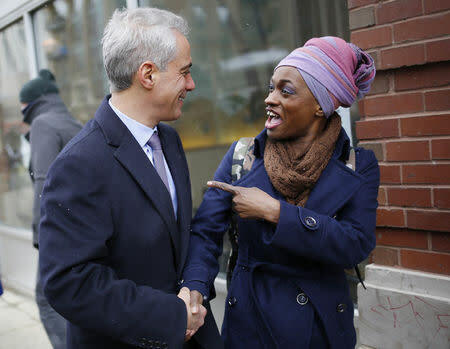 Emanuel does have powerful allies among African-American and Hispanic leaders, including Obama and Illinois Congressman Luis Gutierrez, who said after Tuesday's election Emanuel was "well-positioned" to win the run-off. "Rahm's campaign is about making Chicago better for all Chicagoans - from every neighborhood, background and family, and he's making his vision for one strong Chicago clear everywhere he goes,” said Emanuel campaign spokesman Steve Mayberry, when asked about support in black and Hispanic wards. He cited in particular the mayor’s push for a higher minimum wage, and initiatives to expand a kindergarten program and to make community college places more accessible. Garcia must convince residents of all ethnicities that he is a viable politician to run the city and not just a protest candidate used to send a warning to Emanuel, political strategists said. He must also get more of the vote out – overall turnout for all voters was 33.6 percent last Tuesday. 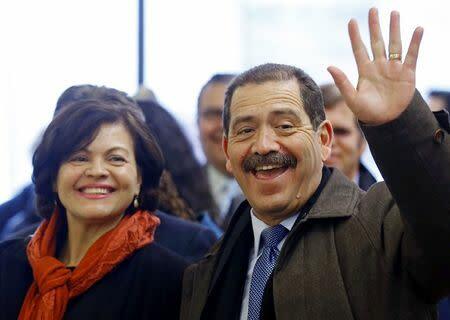 "If Chuy can win this race, it's because he can put together all these different groups who aren't talking with each other as much as they should be," said Kevin Lampe, a political consultant. "He has to build a new coalition." Garcia does have some major supporters within the black community. He has, for example, the backing from Karen Lewis, the charismatic black president of the powerful Chicago Teachers Union. Lewis had planned a run against Emanuel herself but backed out after being diagnosed with a brain tumor, and then threw her weight behind Garcia. Jonathan Todd, a black community activist, said Garcia's ethnicity may have hurt him among some blacks. "We have to find a way to bridge that racial gap," said Todd, who supports Garcia. Despite his small campaign fund, Garcia has much positive momentum, said political strategist Vince Casillas, Obama's Spanish-language press secretary in 2008, who has friends on both sides. One thing that will help is if Lewis campaigns for him, said Casillas. Another strategy would be to organize in areas where schools were closed. Cobb said that in the black community, Garcia needs to point to both his alliance with Mayor Washington, and his current job as floor leader for Cook County Board President Toni Preckwinkle, another powerful black politician. Tamika Ford, 33, an African-American shop assistant who graduated from one of the shuttered public schools, said Garcia's ethnicity doesn't matter to her. "Chuy could probably change things up a little," said Ford. "Obama did it so why not Chuy? He's from a different culture and he's looking out for all cultures, not just one side."